The composer Jacquet of Mantua suffers more than most Renaissance historical figures from problems of identity and nomenclature. He is referred to in French as Jachet de Mantoue, and during his long professional career in Italy as Iachet da Mantova and Iachetus Gallicus, but most often simply as Iachet. The use of a diminutive only, especially one derived from such a common Christian name as Jacques, gives rise to obvious problems of identification, as the well-known case of ‘little Josse of the fields’, the leading composer of the previous generation, makes clear. This Jacquet is to be distinguished especially from another composer of the same name and active at much the same time, who came from a village outside Antwerp and is known, following the name of the village, as Jacquet de Berchem. The Mantuan Jacquet was from Vitré in Brittany and bore the surname Colebault, Latinized in archival documents to Collebaudi; he is thought to have been a relative of the virtuoso singer Antoine Colebault, sometime of the Ferrarese and Papal chapel choirs, and by or for whom additional (‘si placet’) parts to various pieces are conjectured to have been written. Although, as is so often the case, little is known of his early life, Jacquet appears to have travelled to Italy by the late 1510s, by which time he was already in his mid-thirties. After a spell at Modena, during which time his work came to the notice of the Este family of Ferrara, he took up residence in Mantua by 1527, remaining there until his death thirty-two years later. (His tenure was thus similar to that of the somewhat younger Adrian Willaert at St Mark’s, Venice, who also arrived in 1527, dying in office in 1562.) Jacquet’s principal patron was Cardinal Ercole Gonzaga, one of several members of the Mantuan ruling family who had highly successful careers in the Church: Ercole narrowly missed out on election to the Papacy in 1559, and he presided over the Council of Trent’s deliberations during the final two years of his life (1561–3). Although from 1534 Jacquet was nominally maestro di cappella of the city’s cathedral, it was Ercole rather than the cathedral chapter who paid his salary. The Gonzaga, ruling family of Mantua since the early fourteenth century and promoted through the ranks of the nobility to ducal status in 1530, had been limited in their cultural pretensions until the arrival in the city of Isabella d’Este (1474–1539), daughter of Duke Ercole I of neighbouring Ferrara, who married the Marquis Francesco Gonzaga in 1490. During the half-century that followed, including the years after the death of Francesco in 1519, Isabella was the leading patron at the court, and it was under her influence that Mantua became a centre of secular music and of other arts. There seems to have been only limited overlap between the musical activities of the Gonzaga court and of Mantua cathedral, however—except in the sense that Jacquet was established in the cathedral but as a creature of the ducal family. This is all the more surprising when one considers that the Gonzaga did not construct a private chapel building until after Jacquet’s death, installing instead the court’s sacred music ensemble in the Lady Chapel, Santa Maria dei Voti, within the cathedral. Although the court establishment included the two major figures in the secular genre of the frottola, Marchetto Cara and Bartolomeo Tromboncino, Jacquet is the only composer of any substance to have graced the ecclesiastical organization in Mantua at this time. It was fortunate for his contemporary listeners, therefore, that he wrote such a significant quantity of sacred music, and that it is of such fine quality. The Mantuan cathedral choir was large in comparison with the importance of the duchy, with approximately fifteen adult singers and about a dozen boys on average during Jacquet’s career. As with other Italian choirs such as that of the Sistine Chapel, however, it may well have been the case that the performing forces for polyphony were considerably smaller, possibly even single voices to a part. Nonetheless, the complement of thirteen singers on the present recording is a plausible one for this repertoire, even if the mixing of genders would have been unacceptable in Renaissance Mantua. Jacquet’s musical output is substantial, running to twenty-four known Mass settings, rather over a hundred motets, a cycle of twenty-six Vesper Hymns, Psalms which were published in collaboration with Adrian Willaert and others, Lamentations, and two Passion settings. In total this is a comparable achievement to the other leading figures of his age such as Willaert and Nicolas Gombert, with a greater emphasis on Mass composition but almost no secular music. No doubt this weighting reflects Jacquet’s position at the cathedral and the existence of a separate courtly musical establishment within the small city of Mantua. The fact that Jacquet’s music is rather poorly known in modern times is no reflection on its quality, which places him among the very best of the mid-century composers. However, a considerable portion of his output is unavailable in modern edition, due principally to the early death of the musicologist George Nugent, who had been in the process of editing the motets. Nugent had contributed substantially to understanding of the true extent of Jacquet’s compositional activity by sifting out those pieces incorrectly attributed to him. But despite the recent posthumous publication of a further volume of Nugent’s edition, a considerable quantity of material remains unedited, including nearly half of the Masses. Missa Surge Petre is among those not yet available and was edited especially for this recording. Both the Mass and Jacquet’s own motet on which it is based (the latter published by the Parisian printer Pierre Attaingnant in 1535) are scored for six voices. Perhaps this unusually sumptuous scoring reflected the dedication of Mantua Cathedral to St Peter: one can well imagine either piece being performed at patronal festivals there. According to its printed source (Paris: Le Roy and Ballard, 1557), the Mass divides the Altus voice as well as the Bassus, but in reality Le Roy and Ballard’s Secundus Altus has the same range, if a slightly higher tessitura, than the Tenor, meaning that the motet and Mass are both effectively scored SATTBB. As is customary in the genre of the imitation or ‘parody’ Mass, the composer takes themes from the motet as structural points for imitation throughout the cycle. The opening motif from the motet, which illustrates the text ‘Arise Peter’ with an upward leap of a fourth or fifth, provides the initial material for four out of the five Mass movements, almost conforming to the ‘head motif’ principle of Mass organization dating back to the previous century. The Sanctus, however, adopts instead a melody based on the final theme of the motet ‘claves regni caelorum’ (‘the keys to the kingdom of heaven’), which is placed against the rising fifth of ‘Surge Petre’ in the bass part. Moreover, Jacquet’s treatment of the motet material is more subtle and varied than that of his fifteenth-century predecessors. None follows the precise order of entries of the motet, nor do the voices ever enter at the same temporal distance. Jacquet thus recreates the imitative nexus of the polyphony anew in each Mass movement, while preserving a strong feeling of unity between all of the movements and the model. Other melodic elements of the motet which reappear in the Mass include the opening of the secunda pars, ‘Si diligis me, Simon Petre’ (‘If you love me, Simon Peter’), which is used at the ‘Et in Spiritum Sanctum’ (‘And in the Holy Spirit’) section of the Credo, and most tellingly at the final section of the Agnus Dei, in both cases making use of the motet material’s gentler feeling to contrast with the generally more forceful opening material. The setting of the name ‘Simon Petre’ with the two highest voices rising in thirds (at 5’22) is particularly beautiful, and is heard again at the very end of the Mass, to the phrase ‘dona nobis’. As mentioned, the ‘claves regni’ motif begins the Sanctus, though in a version significantly altered such that the triumphant syncopations of the original motif are transformed into quiet rejoicing. Jacquet based five of his Mass settings on his own motets, retaining in each case the same number of voices between model and Mass (in contrast to the practice of Gombert, who generally reduced the voice count by one, for instance in his Mass/motet pairs Beati omnes a5/Missa Beati omnes a4 and Media vita a6/Missa Media vita a5). All Jacquet’s other Masses, in common with the great majority of his works generally, are for five voices. The text of Surge Petre is a little unusual, not so much because it concatenates several texts relating to St Peter’s life, but rather because successive statements are made by different people, so that the point of view is continually changing. First, in a paraphrase of Acts 12: 7, the angel instructs the chained Peter to arise and dress, for the shackles will fall from his hands. The focus then shifts to the words of Jesus: ‘You are Peter and on this rock I shall build my church’ (Matthew 16: 18–19). The secunda pars begins with the interlocution between Jesus and Peter, based on John, chapters 21 and 13, in which the apostle is saddened at being asked whether he loves Jesus. Here Jacquet’s compositional response to the text is to set the words ‘Tu scis, Domine, quia amo te’ (‘You know, Lord, that I love you’) to a repeating phrase with somewhat ungainly word-setting, illustrating St Peter’s discomfiture at the question. (Contrastingly, the words of Jesus where he addresses Peter directly—‘Tu es Petrus’ in the prima pars, and as noted above, ‘Simon Petre’ in the secunda—are the most gorgeously set in the entire piece.) The next section of text is not Biblical but taken from the Magnificat Antiphon for First Vespers of the feasts of SS Peter & Paul and of St Peter’s Chains. In this section, Peter is again the addressee, but this time the Church is speaking, and the events referred to are in the past (‘tibi traditae sunt claves regni caelorum’—‘to you have been handed the keys to the kingdom of heaven’). The motet text as a whole thus combines four separate aspects of the saint’s life, both before and after his martyrdom, while managing to include a musical repeat so that the triumphant ‘claves regni caelorum’ ending recurs in the secunda pars, this time with an additional Alleluia. In terms of depiction of St Peter, the text is best regarded as analogous to the tradition in the visual arts, whereby saints are depicted in multiple locations within the same painting, illustrating various episodes of their vitae. This is an essentially medieval conception, which in painting had yielded to more visually realistic schemes by Jacquet’s time, but in terms of musical style the motet suggests a rather later date of composition than the mid-1530s. With the exception of a few archaic cadence formulae, it could almost be an early work of Palestrina, who was under ten years old when this piece was published. For the reasons explained above, Jacquet’s contribution to the development of church music in the middle third of the sixteenth century has not yet been fully evaluated, and pieces such as Surge Petre suggest that he might well deserve a much more central position in the Italian scene than has previously been allowed. The two three-voice motets recorded here, Ave Maria and O pulcherrima inter mulieres, are both taken from the multi-composer collection Motetta trium vocum, published by the Venetian printer Antonio Gardano in 1543. Four composers are named on the title page, where ‘Iachetus Gallicus’ takes pride of place ahead of ‘[Cristóbal de] Morales Hispanus’, ‘Constantius [Costanzo] Festa’, and ‘Adrianus VVilgliardus [Willaert]’. Jacquet is indeed the best represented composer in the print, with twelve out of twenty-eight pieces, arranged in groups of three according to their modality. They are scored for a restricted range of two octaves, with two upper and one lower voice (cleffed c2-c2-c4 or two mezzo-soprano and one tenor clef), and are thus suitable for performance with lower or (as here) upper voices only. Ave Maria, in the Mixolydian mode, is a smoothly untroubled setting which radiates confidence in the sanctity of Our Lady, whilst the Phrygian-mode O pulcherrima inter mulieres transmits more of the melancholy associated with that tonality. The text draws on imagery from the Song of Songs, and the setting reflects the bitter-sweet sense of phrases such as ‘you have wounded my heart, my bride, my beloved’. Although O vos omnes is written for only four voice parts, the motet carries an emotional heft appropriate for its position in the Holy Week liturgy. The music’s expressivity rests on two devices: the first is the preponderance of passing minims, as in the phrase ‘qui transitis per viam’, where each voice in turn descends slowly, creating harsh dissonance on the way. Following the homophonic phrase ‘si est dolor similis’ (1’29), all four voices join in simultaneous descent, including the most extreme manifestation of the descending phrase, where the bass part begins on middle C and sinks by step through a twelfth to low F. The second element of Jacquet’s text expression is the control of musical time: in the secunda pars the rate of musical event is gradually slowed down as the texture is stripped away, reverting to the archaic structure of pair imitation (tenor and bass duet followed by alto and soprano, in invertible counterpoint) at ‘dissipatae sunt’. The text ‘Tristis est anima mea’—words of Jesus in the Garden of Gethsemane—receives a melodically very static setting, and the texture winds down eventually to the homophonic stillness of ‘mortem autem crucis’, which dovetails into a reprise of the opening. The overall effect of this piece is one of pain and deep sadness, achieved with remarkably simple musical means. Domine, non secundum peccata nostra is one of Jacquet’s most impressive but also strangest pieces. It was published in 1535, like the motet Surge Petre, by Pierre Attaingnant, and in certain respects is rather more representative of the style of the mid-1530s than that piece, while also displaying the control of form that Jacquet exhibits elsewhere. The piece is divided into three sections, with the middle one restricted to lower voices—indeed, the voice ranges are entirely different, with the outer sections cleffed c1-c2-c3-c4-f4-f4 (or soprano, mezzo, alto, tenor and two bass clefs) and the secunda pars c4-c4-c4-f4 (three tenors and a bass). The opening is sombre, with both bass parts rising slowly from the key note beneath a tenor pedal; this texture is then repeated at the upper octave by the three higher voices before the full ensemble is first heard some fifteen breves into the piece. This concern with high- versus low-voice contrast is developed later on, when a high trio introduces the phrase ‘quae fecimus nos’ before ‘neque secundum’ once again features voices rising from a low point, but this time at a considerably more rapid rate, again with held notes above. The aesthetic here appears to be one of varietas, the late-fifteenth-century concept in which excellence in composition was achieved by the presentation of many different ideas and textures within the same piece. But a more modern expression is found for ‘retribuas nobis’, where tenor and bass exclaim in thirds, before the upper voices repeat and ornament the idea. An extended plagal cadence brings the prima pars to an end. The four-voice secunda pars is based on similar ideas: rising runs and long held pedal notes at the top of the texture, a most unusual disposition in the sixteenth century, indeed at any time. Most striking about this section is the quasi-homophonic recitation on ‘misericordiae tuae’ and again ‘facti sumus’. Between these, the word ‘pauperes’ inverts the prevailing texture, with the highest voice singing a sequence of rapid scalic phrases while the other three voices hold long notes. This section seems particularly experimental and has a haunting beauty which relates to the penitential text as a whole, while attempting only at times to express it directly. The final section begins with another highly effective use of textural contrast, with the restored upper voices holding a series of ethereal, slowly shifting chords (‘Adiuva nos’) before the full choir is rather vigorous in describing ‘God our salvation’ (‘Deus salutaris noster’). Another upper-voice trio sets ‘et propter gloriam nominis tui’, and the complete texture returns for the entreaty ‘libera nos’. A final textural contrast, and another manipulation of musical time, occur at ‘propter nomen tuum’, which resolves gradually into the final cadence. 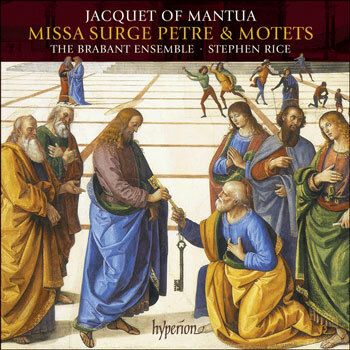 Jacquet’s methods here are very different from the more familiar ones of Surge Petre, even though the two pieces both date from relatively early in his long career; but Domine, non secundum peccata nostra has a strange beauty found only rarely in any period.